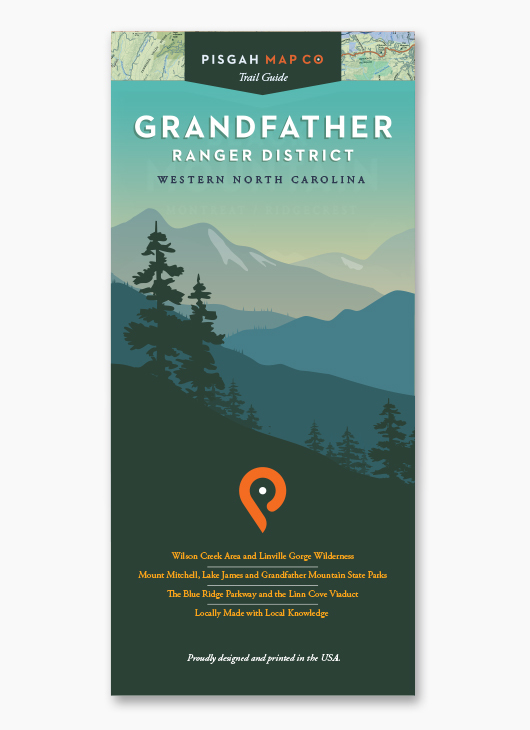 Grandfather Ranger District Map- Latest Edition with New Cover — Pisgah Map Co. The latest edition of our Grandfather Ranger District map is now available with a beautiful new cover. This map has several updates that include the newest stretch of the Fonta Flora State Trail in Burke County, the recently reclaimed Thunderhole Trail just south of Julian Price Memorial Park and lots of small cartographic tweaks. If you aren't familiar with this area, the Grandfather Ranger District of Pisgah National Forest stretches northeast from Asheville to Blowing Rock and includes the Linville Gorge Wilderness Area, the Wilson Creek National Wild and Scenic River, and the Brown Mountain OHV. In addition, this area includes Mount Mitchell, Lake James and Grandfather State Parks along with an unbeatable section of the Blue Ridge Parkway. Summer is here and it's a great time to get out and explore! Pick up this map at any one of our awesome local retailers found here or you can purchase it online from us.